I had ceased now to feel mediocre, accidental, mortal. Whence could it have come to me, this all-powerful joy? I was conscious that it was connected with the taste of tea and cake, but that it infinitely transcended those savours, could not, indeed, be of the same nature as theirs. Whence did it come? What did it signify? How could I seize upon and define it? Proust had his madeleines, I have pork chops. Ms. Raskin was kind enough to post about our upcoming Homage dinner at The Vendue‘s Drawing Room. I’ve been stewing on this for a while, digging through Charleston Library‘s archives, sifting through old menus on ebay, even posting a question on the Charleston History Before 1945 Facebook group that resulted in a protracted and overwhelming response. In short, as much of an awesome and collaborative culinary scene as we have had here in Charleston, our restaurant culture seems relatively recent. Charleston’s fame as a dining destination was built originally on the merits of her home cooks. The bulk of the documentation we have underscores these traditions were built largely upon the heady mix of European Colonialism, African Diaspora and Native American influence. 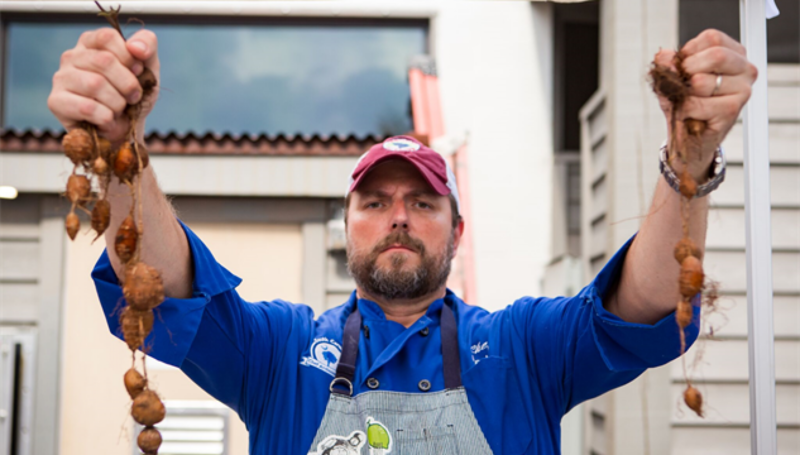 As a cook in Charleston, you quickly come to understand that you’re standing on the shoulders of giants. Of course there continues to be refinement, elevation, restoration and a common push to continue to be better, to stay relevant on a larger scale, but all of this is predicated by those who came before us. As Charleston’s Art Hotel, The Vendue refreshes the art throughout the hotel several times a year. Along with that, Drawing Room hosts a preview dinner the night before the art reception opening. For our next installation, coming up on April 5, I was told the theme for the Artist’s dinner was “Homage.” To what, I thought, would I pay homage? There’s one thing I DO know for sure though- it’s going to be Delicious! Hope to see you there. Postscript- I did want very much to make mention of and to link to a few things regarding Charleston restaurant history- articles from Theresa Taylor, Robert Moss, Erin Perkins, Hanna Raskin, an audio podcast from Southern Foodways Alliance, as well as to embed (below) a longer article from Charleston Magazine from 2007 – I had difficulty finding this online, but the good folks were kind enough to grant permission for me to reprint – a very, very genuine “Thank you” to all above for the inspiration and subsequent trip down the rabbit hole! Previous PostPrevious O Rye The Hell Not?